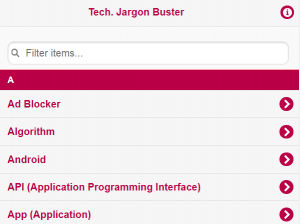 As part of our Digital Essentials online course to support SHU staff in developing their digital capability, we’ve developed a ‘Jargon Buster’/glossary resource that helps explain some common, and not-so-common, technology terms that you might hear. The resource is designed to work on both mobile devices and desktop/laptop computers and you can browse through the list or search for specific terms using the text box at the top of the page. The resource is available now and we welcome any feedback, including suggestions for terms to add and ones that may need further work. So please, click the link above or the image to the right and try it out. If you find it useful, make sure to bookmark it for quick access in the future. March 1, 2019 in Announcement, Output, Resource. Tags: continuing professional development, Digital Fluency, General, Mobile, Professional Development, Resources, Technology, What_is_a?